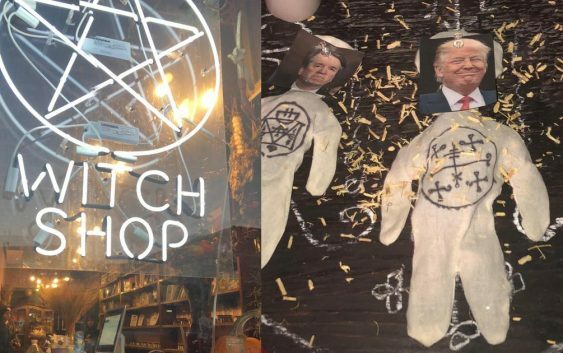 About 60 people met at Catland bookstore in Brooklyn on Saturday to use witchcraft to put a hex on the newest Supreme Court Justice, Brett Kavanaugh. Dakota Bracciale, co-owner of Catland, said the ceremony was more than just witchcraft, it was a protest. “Yes it’s a protest, yes it’s a religious ritual. It can be both,” Bracciale told CBS News. The group met inside a dark room with folding chairs, chanted before an altar that was lit with candles, and read Bible passages aloud. On the alter were three “poppets” — or cloth dolls made to look like real people. Those three people were Kavanaugh, President Trump, and Senate Majority Leader Mitch McConnell. As Christian music blared, people took turns giving sermons and singing hymns. “I’m not here for Kavanaugh, I’m here for your souls,” one counter-protester was heard saying over the loud speaker outside. “You can do hexes, you can do whatever you want, it’s not going to nullify the kingship of Jesus Christ,” another person outside was heard saying. The New York Police Department was called to the scene after receiving noise complaints, Bracciale told the group inside before the hexing ceremony started. 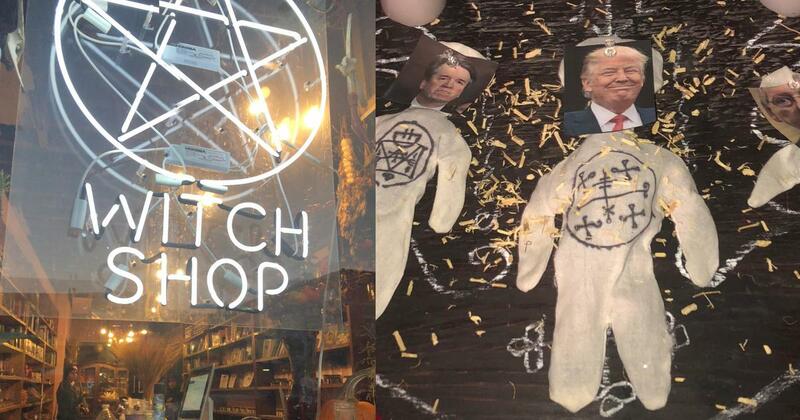 The store owner has been practicing witchcraft their whole life. Many of the attendees, however, did not identify as witches or practice witchcraft regularly. Several expressed their desire to attend the event to protest Kavanaugh’s appointment to the Supreme Court after Dr. Christine Blasey Ford testified that he had sexually assaulted her when they were both in high school.